The setup improvement alone had me at +20 pounds at the 6 day mark on my Deadlift so the proof is in the results. Pavel's comments on the results, linking it back to techniques or principles, which have worked for me. My goal is a 40lb increase in my 3 rep Deadlift in 30 days. The deadlift can lay serious claim to be the single most important exercise you can ever do—if your goal is to develop supreme strength and total body power. And who better to help you to achieve your ultimate strength and power gains than 6-time world champion and multiple record holder, Andy Bolton—backed by the expertise of renowned strength authority, Pavel Tsatsouline? How sure are we that Deadlift Dynamite (paperback) will work for you? Simply fill out the form below and put Deadlift Dynamite (paperback) to work for you right now. Obviously, we would go out of business if Deadlift Dynamite (paperback) didn't work, the way we said, right? With the promise of a full refund if you're unsatisfied, you have nothing to lose by trying Deadlift Dynamite (paperback). Go ahead and try it today. The first section of Deadlift Dynamite "How to Lift", provides a safe, progressive, technically-detailed plan on how to get started right in the iron game, avoid the typical mistakes and years of frustration, and see extraordinary results in even the first year of training. Intermediate lifters will appreciate the world of subtle tips and masterly insights—which will help them bust through plateaus and surge forward in their gains. 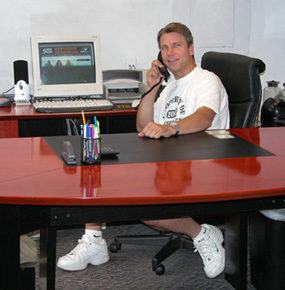 And the savvy coach will recognize he now owns the ultimate blueprint for producing champions—in many athletic fields. Whether your goal is to excel in the sport of powerlifting or you just want to become stronger and more muscular— Deadlift Dynamite is for you. There are many approaches to muscle and strength building, some effective, more marginal, most nearly worthless. Powerlifting’s half century of existence has undeniably proven that this sport offers the most time-efficient methods for making you BIG and STRONG. As one of the strongest men on the planet, Andy Bolton’s contribution to Deadlift Dynamite is unassailable—yet couched in a simple, direct and totally accessible style. Pavel’s goal is to compress the period it would take you to master championship lifting technique, like Andy’s, from decades to years and even months—while avoiding the many health problems lifters who train incorrectly develop along the way. 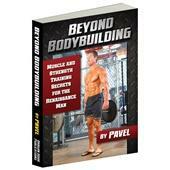 Discover also Pavel’s state of the art flexibility and mobility exercises specific to lifting—exercises which have received a strong thumbs up from the elite of the iron game. The secondary goal of these exercises is health and longevity. The primary goal is strength. "Deadlift Dynamite really delivers. Don’t let the title fool you, this book covers much, much more that just the deadlift (just take a quick look at the table of contents). 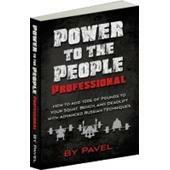 We have been eagerly awaiting this book since we had heard that Pavel and Andy Bolton were joining forces to write it. This book met the Results Fitness very high expectations and much more. 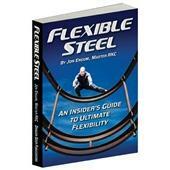 We would consider it a must read for any and all strength enthusiasts from beginner to advanced. It is an incredibly thorough and very well illustrated book on various aspects of strength training. Quite literally, there is something for everyone and no stone is left unturned!" When it comes to programming for world-class lifts, Andy Bolton is the undisputed results-master. In Deadlift Dynamite the champion reveals his classic templates that have helped him earn title after title—and can forever turn around your own success as a conqueror of the unforgiving iron. The second section "How to Lift More" is aimed at the experienced lifter. Pavel and Andy go into great detail describing the deeper subtleties of world-class deadlift technique and teach you state of the art assistance exercises. While the deadlift is the focal point of the book, the squat and the bench press also receive the attention they deserve—to provide lifters, of all levels, the absolute essentials to excel in these great lifts as well. Lifting heavy loads of unforgiving iron can wreck both the ignorant amateur and the less-than-properly informed "pro". Deadlift Dynamite provides the professional attention to detail, the gradual progressions and the detailed technical secrets to ensure you get stronger and bigger year after year, whatever your current level of expertise—with minimum risk and maximum gain. Andy and Pavel leave NOTHING out, and reveal EVERYTHING you could possibly want to help you meet your strength and size goals—however ambitious. 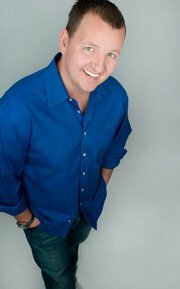 "Andy Bolton is to the Deadlift what Tiger Woods is to Golf, Michael Jordan is to Basketball and what Roger Federer is to Tennis. He’s the first guy to Deadlift 1000lb, so there’s simply no better person you could ever learn how to Deadlift from. If you’re new to the deadlift – Deadlift Dynamite will show you how to Deadlift with proper form so you gain strength and muscle without hurting your lower back. If you’re already an experienced deadlifter, expect to discover new techniques and cues to take your deadlift to the next level. I’ve been Deadlifting for a couple of years, pulled 3x my own body-weight and yet I still picked up several tips to apply to my own training. Andy and I have talked before and he knows what he’s talking about. 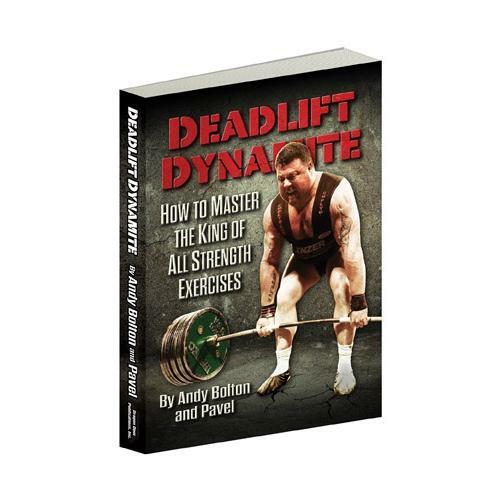 If you consider yourself a serious lifter with serious goals, Deadlift Dynamite is quite simply required reading"
I have never seen a world-champion powerlifter and strength coach teach people how to deadlift, squat and bench properly. The people I see usually just start off doing things incorrectly from day one and eventually end up with injuries down the road. I am happy to have read a copy of Deadlift Dynamite and wish I had the chance to learn from these experts from my start. There sure are many people that think they know how to lift big and heavy weights but will never reach their potential unless they take it seriously enough to do it the right way. 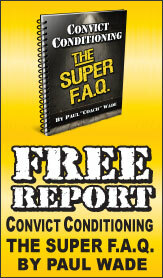 I encourage ALL serious lifters to read this program by Andy Bolton and Pavel!" 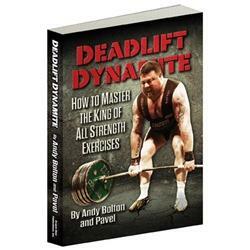 "As a long time fan of both Pavel and Andy Bolton, I was thrilled when I received Deadlift Dynamite. It’s very well written and easy to apply, so I immediately recommended it to my team of trainers. 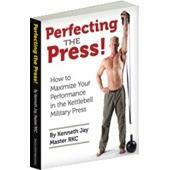 Likewise, I recommend it to all strength training enthusiasts and coaches alike." Who Needs Deadlift Dynamite and Who Doesn’t Need It? If you already have a world class deadlift, squat and bench press and feel 100% sure of how you will improve your numbers in the future, whilst staying pain-free and healthy—you might not need this. If you’re the kind of guy who can walk into ANY gym, start lifting and make people’s jaws hit the floor because you’re just that damn strong—you might not need this. If you already have access to insider training knowledge from the best strength athletes and coaches on the planet—you might not need this. However, if you have ONE of the following problems, I highly recommend that you grab yourself a copy of Deadlift Dynamite. You have thought to yourself "all I need is a good coach and my strength would skyrocket"
OK, so if you don’t have any of those problems, you might not need Deadlift Dynamite and it’s likely that you are already brutally strong and a world class strength athlete. If that’s the case, I wish you well and please carry on what you are doing in the gym. However, if you have one or more of those problems, you’re going to love Deadlift Dynamite when you grab your copy today. Are You Ready To Get A Lot STRONGER? Deadlift Dynamite is the ultimate "How To" guide for building a huge deadlift, adding slabs of granite-hard muscle to your body, smashing your bench and squat PR’s and bullet-proofing yourself against injury. As a publisher, it’s my honour and privilege to be able to offer you this book – written by one of the strongest men to ever live and one of the smartest strength and conditioning coaches on the planet. 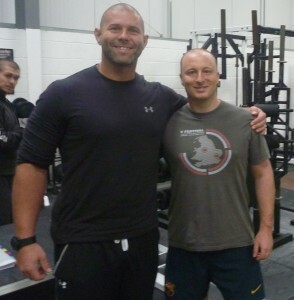 It is no exaggeration to say that Andy Bolton and Pavel make a dream team when it comes to teaching you how to get a lot STRONGER. And you’ll get all their SECRETS when you grab your copy of Deadlift Dynamite. Not everybody is ready to get stronger. Some people never will be. The sad truth is that many lifters would rather spend their entire lifting careers "program hopping", wasting their time in the gym, making excuses and FAILING to get much stronger. Worse still – many lifters injure themselves and live in constant pain because they lift with horrible form and have no clue about how to program their training in a sensible way. "Are YOU ready to get a lot stronger?" If you answered "YES" and would love to smash your deadlift PR, send your bench and squat numbers skyward, improve your physqiue – both aesthetically and functionally – and annihilate your competition in the heat of battle, get your copy now. This book I consider to very definitely have a Hardstyle flavor in the background, but ever present. Pay attention to detail in setup and be aggressive (Andy Bolton), reminds me of Donnie Thompson saying "Come up with tremendous power to lockout. Don't play passive." Pavel's explanation of programming (my favorite is the wave cycle ;) and what it might feel like helps me as I practice to stay as pure to the authors intended outcome as possible. The collaboration works and I thank both of you. My deadlift thanks you. Andy Bolton is not only an outstanding strength athlete, but an incredible writer as well.Anyone interested in strength development should add this book to their library.Just about every aspect of proper power lifting is explained clearly and thoroughly in layman terms. Impressed with explanations on good form and prevention of injuries. Been messing around in gyms most of my life but my son is growing up and him being very active in sport I can now teach him the correct form from the start and prevent unwelcome injuries. It covers all from beginner to pro. If you aspire to be a power lifter, this is a great book. I don't want to be a power lifter. For me, Power to the People is the ticket. I don't care about assistance work, etc.. Mr. Bolton is obviously highly qualified and offers a very comprehensive work. My desire is to simplify. If you are an aspiring power lifter, then this is a great book. This was my introduction into the world of powerlifting. It has taken my strength to a new level and helped improve my performance in athletics. The approach is really simple and straightforward with clear progressions to address various weaknesses. 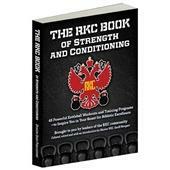 A great book for improving strength, though if you need more conditioning, it can't be the only tool in your arsenal. Great book. Well set out, easy to read, lots of pictures. 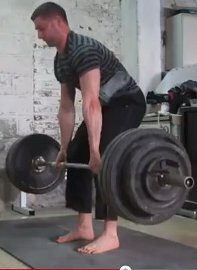 Lots of helpful technique tips for the deadlift. Wish I had read the book earlier before I formed bad habits.